Fat loss is on the top of many people’s lists these days. People will try all sorts of weight loss programs only to be disappointed with the results. Trend diets may give quick results but they are not a long term solution to weight loss. Still the most effective way to successful weight loss is eating a well balanced diet including a healthy breakfast. It’s true when they say breakfast is the most important meal of the day and here are the reasons why. Before delving into the facts, let’s just take a look at the definition of breakfast. Breakfast comes from the words breaking of fast. You might ask, “When did I fast?” The answer is, from the time you went to sleep until the time you woke up. So, how can breakfast actually help to lose weight? When you skip breakfast, you’re more likely to crave food later in the day and make poor food choices. When hunger hits unexpectedly you will be tempted to snack or eat fast food which is high in calories, sodium and fat. If we think about the way our bodies store and use calories you’ll understand why it’s important to start our day with a proper meal. We burn most of our energy during the day while we’re at work or at play. Our bodies need to use the calories from what we’ve consumed to exert the energy. By eating when we wake up we’re able to use those calories throughout the day. As our day winds down we need fewer calories. In Western cultures we typically eat our largest meal in the evening. However, consuming most of the calories at the end of the day is counterproductive. We don’t burn as many calories during our sleep as we doing being active during the day. The calories we don’t burn off at night stay in our system and eventually turn into fat. Therefore, it makes more sense to eat are largest meal in the morning, a slightly smaller meal at lunch and an even smaller one in the evening. It’s not just about having breakfast. The foods you choose to eat are also important when trying to lose weight. The best breakfast options include protein, carbohydrates and healthy fats. Foods high in fibre are also a good choice. An example of a well balanced, healthy breakfast is a hard-boiled egg, whole grain toast with peanut butter and a piece of fruit. Yogurt with almonds or another unsalted nut is also a good choice. 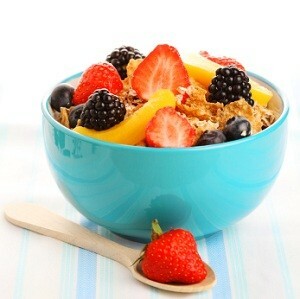 In the colder months oatmeal with fruit is a great options as it warms you up and makes you feel full for longer. Although it’s not a great choice to have every day, fried eggs and bacon can be enjoyed every once in a while. If you’re rushed in the mornings and don’t feel there’s time to start your day with a healthy meal there are some other alternatives. A smoothie made with low fat milk, fruit, yogurt and a little protein powder is great for someone on the run. Another option would be to grab a protein bar on the run. Choose one that has a normal level of protein and not something overloaded with protein. Also, read the labels and avoid the bars that have a lot of added sugar or artificial flavors. If you have the time there are many recipes out there for you to make your own protein bars. That way you know exactly what’s going into them. Speak with any dietician or nutritionist and they will all say that breakfast is extremely important for weight loss or maintaining a healthy weight. Make a good start and you’ll be pleasantly surprised when you start to lose the weight. You’ll also notice that you’ll be making healthy food choices throughout the day. This entry was posted in News Magazine and tagged breakfast, diets, healthy breakfast, healthy eating, losing weight, weight loss on November 1, 2012 by admin.